The psalmist gives a loud cry in Psalm 5: "Give ear to my words, O LORD; give heed to my sighing. Listen to the sound of my cry, my King and my God, for to you I pray." The writer of the psalm is crying to God, asking for help. In the midst of violence, he begs God to destroy those who are telling lies. Perhaps he has been accused of wrongdoing himself, and is now pleading his case to God. 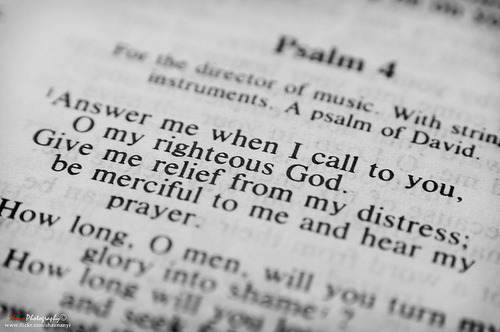 The psalm can be used today by anyone being threatened by wicked, evil, boastful, bloodthirsty or deceitful people. You know them: Friends who are really enemies -- I've heard them called "frenemies." Thugs. Put-down artists. Those who try to undermine and destroy you. Sleazy people. Anyone who lies, cheats and steals, showing no regard for the welfare of others. In short, the people who make you want to scream. All of us have them in our lives, every one of us. But yelling at such people face to face is not always an appropriate or productive thing to do. That's why Psalm 5 encourages us to cry out first to God. Believe it or not, we can gain relief simply by speaking honestly about our troubles. Some people call it "Talk therapy." It can do a lot of good for people feeling depressed, stressed or anxious. So why not talk about your feelings with God, who is the Ultimate Listener? In the morning, plead your case -- ask for help with frenemies and other. Pray for strength to face the challenges of the day, knowing that the Lord is "not a God who delights in wickedness."